Watercolor Wisdom is an essential reference for every watercolor artist. 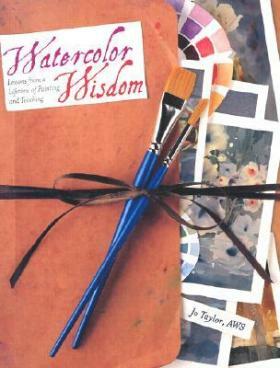 It shares the knowledge, insights, tips and tricks that author Jo Taylor has accumulated over 30 years of painting and teaching, delivering a complete watercolor course that provides all the answers any painter will ever need for good painting. With the friendly tone of a gentle and seasoned teacher, Jo Taylor illustrates each lesson with large examples, stimulating exercises, visual comparisons and diagrams that are as engaging as they are effective. Beginning chapters focus on the basics of strong painting, including color, texture, value, composition and technique. The last chapter challenges readers to develop their design abilities and experiment with new artistic techniques, drawing upon the elements and principles learned to reinforce the lessons of this comprehensive guide.Throughout, readers will find big, beautiful art that teaches as well as inspires. Jo Taylor has been a professional artist since the late sixties. She has studied with many of the best known American artists including Edgar Whitney, Henry Gasser,John Pike, Chen Chi and Charles Reid, and she has received numerous awards for her work including several from the AWS and other watercolor societies. In addition, she has instructed thousands of students through her classes, demonstrations and workshops. She lives in Rockwall,Texas.